I arrived on Bokissa Island, six miles off Espiritu Santo, in 1988 from Tokyo, six months after my husband, Kevin, arrived here from Australia. I had no knowledge of the country, no management experience, and knew only a few words of English. 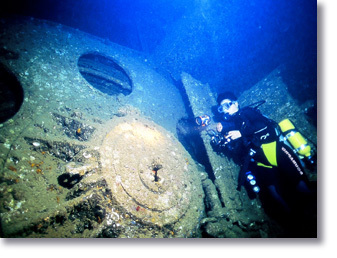 I lived on the island for six years, operated a SCUBA diving business called Bokissa Island Dive, ran Bokissa Island Resort for a few years, then moved to Luganville town on Espiritu Santo Island - to begin the dive company, “Aquamarine”. Back then, I thought people would go mad living on a tiny island, where the pace of life is permanently set on slow motion. But the longer I stayed, the more I learnt about the people, their culture, the nature and timelessness of the island itself. Six years of life on small island taught me to speak Bislama (the indigenous Vanuatu language), to work with ni-Vanuatu people, to deal with cyclones and earthquakes, and it also taught me endless patience and an appreciation of something far more important than the reckless pace of the modern world. In 2005, Inspired by Santo's explorer Glen Russel's story about Pygmies and Lysepsep people who live in the jungle of Vanuatu. 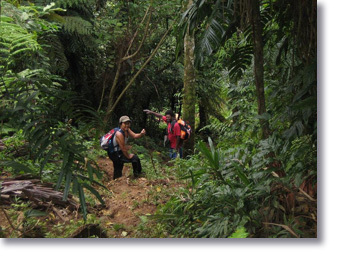 I started trekking into the jungle, to places few Europeans have ever seen. I visited remote villages in South Santo inhabited by people still steeped in five thousand year old traditions, and my heart was captured by the sheer majesty of this landscape and the extraordinary people who live here, until my spirit became part of this land, and part of these people. I am here to introduce you to the fascinating Melanesian people, the majestic island of Espiritu Santo, and to share with you the other amazing islands that make up this unique South Pacific paradise known as Vanuatu. 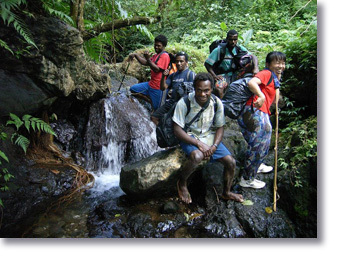 At the end of August 2006, Mayumi and Yumi Takei (a JOCV volunteer at College de Luganville, Santo) completed a successful hike through the tropical jungle of South Santo to a very remote Custom village called "Marakai". 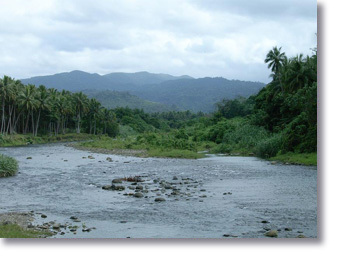 Mayumi had made a shorter trip to Marakai (along with Dr Jo Bell, former vet of Luganville) in November 2005 and was so fascinated by the beauty of tropical jungle and the bush people of South Santo, she could not wait to visit Marakai once more. Mayumi and Yumi’s adventure to Marakai included a 5 night and 6 day hike through Marakai - Tanmet - Vunaspef. The following story and photograph has been supplied by Mayumi Green in the hope of inspiring others to visit the more remote and far-away villages of South Santo. Day 1: Myself, Yumi, our friend Samuel from Vunaspef and Andy from Tanmet (both sons of the Chief of the village) drove to Namoru village in South Santo. There we picked up Thomas and Alexi who where to be our guides to hike us through to Marakai. Samuel and Alexi guided my first trip to Marakai, so I was feeling very comfortable with the crew. We left Namoru village at 10.00 am. Villagers provided their advice of the planned hike and we then left the 4WD behind at Melesule and hiked to Malatao village at Wylapa River. We arrived at Supemalao village (823 feet above sea level) at 1.00 pm for a short rest. While there we met our friend Baba the Nambut (means deaf) and then continued our hike passing Jalakatui village (1,000 feet), and reached Marukari village (1,330 feet) around 2.30 pm. We reached Tabunbotari village (1,154 feet) at 5.00 pm to stay for our first night. This was the same village I had previously stayed at. Last time there was only three adults in the village, but this second time around there was about 50 people in the village and large numbers of pikinini (children), who were back for school holidays and having a lafet (party or celebration) and great time with their families and friends. The boys were playing soccer with a ball made from the Black Palm tree, the ball only survived 5 minutes so they just kept on making more as needed. Only people living in remote areas could invent like this. We bathed in the nearby river with other girls and then we were treated to a kava welcoming ceremony by Johnbos and family, followed by great kaikai (food). That night we slept with 15 other people inside a Nakamal (community bungalow). Inside the Nakamal, the floor was dirt and we slept in sleeping bag on mats made from leaves. Between the mats, there were small fires to keep us warm during the night. The people know how to make a good fire last through the night. Day 2: After breakfast of taro, we left Tabunbotari for our first destination and arrived at 10.30 am at Danis (1,573 feet). There was an abandoned and derelict house we name the “snake house” because we had found a big snake living in the house on the previous trip. We could see Araki Island far into the distance. We walked down to Wylapa River (928 feet) at 12.00 am, and arrived at Tabunvoea (1,018 feet) half an hour later. We started the last big climb to our destination village of Marakai (1,937 feet) arriving there at 3.00 pm. Just like the last time I was there, we were invited into the guest house and looked after by the late chief’s wife Irene, and served with hot kaikai of taro and leaf cooked with ginger and coconut milk. All the women (including my new friend Valerie who was visiting Marakai for a few months holiday from France) were dressed in Mal Mal (custom clothing). 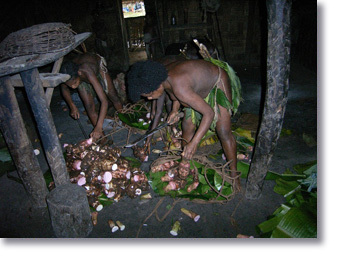 The women were coming back from the gardens with baskets full of taro hung from their heads for the evening meal. As soon as they dropped their huge baskets, the women cut the heads off the taro which was fed to the pigs straight away. The bush people of Marakai are not lazy people at all. They work all day in their gardens which are some distance away from their village. Later, when Chief Moli Sula and Assistant Chief Redion came back from their garden work, the whole village sang "Nagariamel" for us. They used to sing this special song when they lived with Jimmy Stevens who created “Coconuts rebellion” before the 1980 Independence of Vanuatu in Fanafo. After singing, the villagers welcomed us with a Kava ceremony and then we enjoyed the specially prepared kaikai "Nallot". This form of laplap of taro is made using a Batutu (long wooden stick) by 4 - 5 men on a big flat wooden platter. Yumi and I asked to join in and help them and even for a few minutes, it was hard work for our muscles. 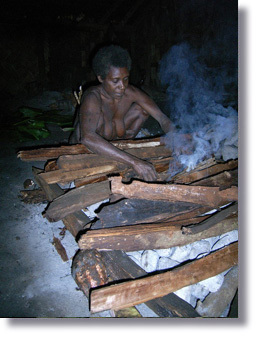 Later that evening, the Chief showed us how to make a fire using special wood with wooded stick. When it was time to sleep, the men slept in the Nakamal, and Assistant Chief Redion showed Yumi and I to the guest bungalow to sleep. He also slept in the same bungalow with us to protect us from any bad spirits. Day 3: We took lots of photographs of Marakai village and had a great day spending time with bush people and their everyday life. Later in the morning, after they sang us a farewell song, we departed the village. Valerie walked with us for a while but then returned to the village. Marakai is a pure custom village. 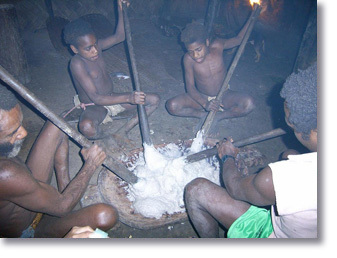 They don't use money and everything for living is grown and taken from the bush environment, including salt which is drained from water and ashes of the Black Palm tree. The men use the bark of the Black Palm for their Mal Mal, and the women use the leaves of Nangaria. Glen and Alexi had advised us that the people don't except money to stay in their villages, so instead we took gifts of sugar, salt, candles, matches, a lighter and other things in return for the hospitality we received at every village. We arrived at Taitaikara, the Dispensary (1,936 feet) at 2.00 pm. The Dispensary was made by community from timber with and iron roof like normal house with 2 big water tanks that had been carried in by volunteers from Luganville. We had short break there, continued the hike passing Jaranatoa village at 4.30 pm and arriving at Arvales (1,180 feet) just on dark at 6.00 pm. It had been a very long and hard walking day. Unfortunately, the village was suffering the death of a child, so we stayed in the guest house and kept very quiet for the night. We were too tired to move anyway. Day 4: We passed the Malunpula River (1,260 feet) at 10.20 am and the Makmakvuai River (1,350 feet) at 11.00 am to arrive at Tanmet village (1,400 feet) at 1.15 pm. There we met Chief JonAu (who is Andy’s father) and our friend Livo from Mavunlef village. They were very happy to see us and the Chief really liked to storian (talking), we had good conversation with him. I saw the girls playing a game called "stonem leg" which was similar to dodge ball, again using a ball made of leaves. 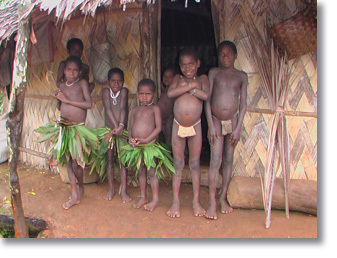 Tanmet is also a custom village with everyone wearing Mal Mal, including the Chief’s family. 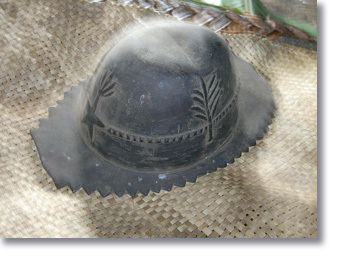 The villagers are Seven Day Adventist and Yumi and I were recommended not to drink kava – that was for men and boys only. It was quite incredible to find strong Christian faith in such a remote custom village far from the town. Day 5: The Chief and his wife Frora walked with us to the top of the hill Tabuavaravu (1,875 feet) arriving at 10.30 am. We had a short break and then continued our hike arriving at Moinpo (1,260 feet) at 3.30 pm. Finally, after 5 long and hard days of walking we arrived at our final destination at Vunaspef village (650 feet) at 5.00 pm. This was Samuel's home village and the starting place for the Millennium Cave tour. YEAH !!! WE HAD MADE IT !!! As soon as we arrived, all the boys grabbed their guitars and wooden base and started the singing. I had no idea how much energy they could muster. Samuel's wife was expected our return so she had prepared huge kaikai of Bunyap (taro, kumara, island cabbage and beef cooked in laplap style). We had yet another Kava ceremony, played music, sang, ate and then everyone slept around a fire in the same Nakamal. Day 6: I was fast sleep until many roosters start to crow outside the Nakamal and everywhere else around the village around 4.30 am. It was still dark, I was still exhausted and tried to sleep again, but couldn’t. Then I heard the beautiful bird sounds and got up quietly to follow the singing. There were huge bushes of bamboo all around the village and everything was so peaceful. I sat down to listen to the birds and the bamboo for a while … and then I heard the sound of the boys playing their guitars again. 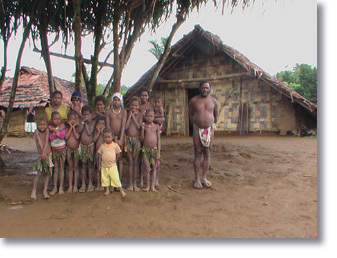 What an awesome experience of tropical jungle, true custom villages and the bush people of Espiritu Santo. Yumi and I heard so many interesting custom stories and saw so much, it was a fantastic experience!!! We had the best guides and company who have become good friends. One of the custom stories of South Santo is that if I were to ask a man for his sister's name, he is not allowed to tell me. The same goes for asking a woman for her brother’s name. Also, they cannot tell you their brother-in-law or sister-in-law names, but they can write the names down. The reason is respect for each other. It is a true story, ask anyone from South Santo. Perhaps we will never understand some of their customs, but that should not stop us respecting and letting people live their lives according to their own custom.